This is newbie and beginner friendly. 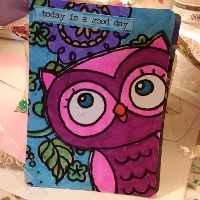 Create 1 ATC for one partner. Get out your adult coloring books and create an ATC. You can also print off your coloring page from the internet! You must alter the page in some way. You can collage, embellish, whatever. But you must put some thought into it. Don't just cut out an ATC size image and color it. You can use background papers, with layering cut images onto it. Any way you choose. But your card should be 75% or more of adult coloring images. Please make a well made card, sturdy. New swap bot members. I check ratings and profiles. You need to have 2 sections of your profile filled out at least one paragraph each. This is newbie and beginner friendly! Partners assigned, if you were removed it was for blank profile.